Sejong the Great (세종대왕, 世宗大王 in Korean),May 6, 1397 – May 18, 1450; r. 1418 - 1450, was the fourth ruler of the Joseon Dynasty of Korea, and a beloved Korean folk hero. Highly educated and a gifted military strategist, he is most famous for commissioning the creation of the phonetic Korean alphabet Hangul by scholars of the Hall of Worthies, despite strong opposition from officials educated in Hanja (Chinese character); the "Hangul" alphabet continues to be used today. King Sejong also established a library and an institution for scholarly research, and promoted men of talent to positions of authority in his government. Under his patronage Korean literature and culture flourished. He encouraged technological advances in weaponry and initiated the use of printing presses. King Sejong is one of only two Korean rulers honored with the appellation the "Great," the other being Gwanggaeto the Great of Goguryeo, the king who expanded Korean territory to China and Manchuria. King Sejong was honored with the appellation “Great” for his accomplishments and contributions. Sejong was the third son of King Taejong of Joseon. At the age of ten, he was given the title Grand Prince Chungnyeong (충녕대군; 忠寧大君) and married a daughter of Sim On (심온; 沈溫) of Cheongsong (청송; 松), commonly known as Sim-ssi (심씨; 沈氏), who later was given the title Princess-Consort Soheon (소헌왕비; 昭憲王妃). 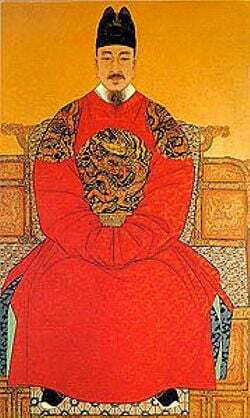 King Taejong (reigned 1400-1418), Sejong’s father, was cautious in choosing an heir to the throne from among his four legitimate sons, due to bitter experiences with two “Rebellions of Princes” over succession to the throne of the early Joseon Dynasty. The young prince Sejong naturally excelled at his studies and was well favored by King Taejong. Sejong's two older brothers are considred responsible for Sejong's unique and uncharacteristic ascension to the throne. When King Taejong stepped down from the throne, his first-born son officially became the new king. The first-born son, however, recognized that he lacked the requisite skills for rulership, and felt that Sejong was destined to become king. He and his brother, the second prince, believing it was their duty to place Sejong on the throne, behaved with extreme rudeness in the court and were soon banished from Seoul. This ploy of the two elder princes ultimately brought Sejong to the throne. The eldest prince became a hunter and lived in the mountains, and the second son entered a Buddhist temple, where he became a monk. In June of 1418, Sejong was crowned King of Joseon and began his rule. However, King Taejong had taken control of the military and continued to control the administration of the government for four years until his death in 1422. On the northern border, King Sejong established four forts and six posts to safeguard his people from the hostile Chinese and Manchurian nomads living in Manchuria. The Jurchens (女真) inhabited this area and the borders were unclear. King Sejong aggressively explored the border and created various military regulations to ensure the safety of his kingdom, supporting the advancement of Korean military technology and the development of the cannon. Different kinds of mortars and fire arrows were tested, as well as the use of gunpowder. In 1433, King Sejong sent Kim Jong-seo (김종서), a prominent general, north to destroy the Manchurian barbarians. Kim's military campaign captured several castles and expanded Korean territory in the north, establishing the border of modern-day North Korea. King Sejong was an effective military planner. After the end of the Goryeo Dynasty, the coastal areas of Korea were often invaded by Japanese pirates (Wakou). In 1367 the government of Korea sent two diplomats to request that the Japanese government (the Ashikaga shogunate) tighten control over the pirates. On their return the diplomats brought two Japanese Zen monks with them. In 1375 another Korean diplomat visited Kyoto, asking that the pirates be controlled more strictly, and brought back a Japanese monk who delivered a letter to the Korean government. In 1377 and 1378, Korean diplomats again visited Japan, and the Japanese feudal Lord Ouchi Yoshihiro cooperated by sending 180 soldiers to subjugate the Japanese pirates. This activity initiated diplomatic relations between the Japanese government and the Joseon Dynasty. In 1401, the Muromachi Shogun, Ashikaga Yoshimitsu of Japan, ordered the officials of Kyushu to regulate Japanese pirates, and at the same time sent a diplomat to open trade with the Ming dynasty of China. In 1404, Ashikaga Yoshimitsu sent a monk as his representative to officially open trade with Korea. In 1406, Korea designated three treaty ports (including Pusan) for trade with Japan, and many of the pirates moved to China and Southeast Asia. In 1419, King Sejong, supported by Taejong as his military adviser, ordered Yi Jong-mu’s fleet of 227 ships and 17,285 soldiers to attack Tsushima (대마도) Island, a stronghold of the Japanese pirates. This attack, called the Oei Invasion, established Korean control of Tsushima until after King Sejong’s death, and ended most Japanese pirate activity. King Sejong supported the development of literature and encouraged higher officials and scholars to study at his court. 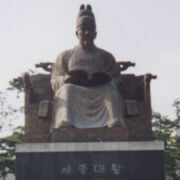 His most valuable cultural legacy was the enactment of Hunmin jeong eum (훈민정음) (“Correct Sounds to Instruct the People”). King Sejong oversaw the creation of a phonetic alphabet, Hangul, consisting of vowels, diphtongs (double-vowels), consonants and double-consonants, and presented it to the Korean people in the Hunmin jeong eum (훈민정음), an announcement composed of both Hangul and Hanja. The Korean people now had an alphabet which could be used to transcribe their own language. Some scholars have thought that such a complex project, the invention of a new written alphabet, must have required research by a team of linguists over a long period of time. 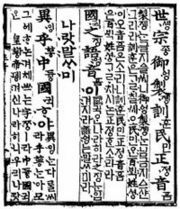 Documents show, however, that King Sejong, who was himself an eminent linguist and phonetician, worked quickly in secret with a small staff of scholars. Thirteen times he sent his linguists to consult a famous Chinese phonetician who was living in exile in Manchuria. Our country’s phonetics are different from the Chinese language and the two languages cannot relate to each other. Because of this, when Korean people want to speak and express themselves using Chinese writing, they are unable to do so. As I regret this situation, I have created a new alphabet of twenty-eight characters, which the Korean people can easily learn and use in their daily lives. Conservative pro-Chinese government officials opposed the usage of Hangul, calling it onmun or “vernacular language” and citing the superiority of the use of Chinese characters (Hanja). Although the upper classes mostly refused to learn Hangul, the new, simple writing system enabled the women of Yangban families and the commoners to be literate, providing a means of general communication and contributing to the rise of a new culture in Korea. King Sejong established the Office for Publication in Hangul, which published such works as his own Yongbi Eocheon Ga (“Songs of Flying Dragons,” 1445, a tribute to the virtues of the royal ancestors). King Sejong also composed Seokbo Sangjeol (Episodes from the Life of Buddha, July, 1447); Worin Cheon-gang Jigok (Songs of the Moon Shining on a Thousand Rivers, July 1447); and the reference work Dongguk Jeong-un (Dictionary of Proper Sino-Korean Pronunciation, September 1447). King Sejong gathered intellectuals from all over Korea, and in 1420, established a Hall of Worthies (집현전; 集賢殿; Jiphyeonjeon) in the royal palace. The scholars of the Hall of Worthies documented history, drafted documents and compiled books on various topics. Furthermore, King Sejong ordered that promising young scholars be selected and sent to study at a temple in the mountains which later became the site of a library. Scholars there read not only Confucian works but the books of other Chinese scholars, and works on astronomy, geography, medicine, and augury. Following the principles of Neo-Confucianism, King Sejong was also a humanitarian. He reformed the legal system with a decree that there must be three trials before a final judgment was reached, and prohibited brutality, such as flogging, in the punishment of criminals. King Sejong is also credited with advancing technology in Korea during his reign. King Sejong called a young man named Jang Yeong-sil (장영실), a prominent inventor who belonged to the lower class, to his court in Seoul. Recognizing his merit and potential, and despite protests from court officials, he gave him an official government position and the authority to invent anything he wished to. Jang eventually invented the world's first rain gauge, a self-striking water clock, and a sundial. Another one of King Sejong’s important projects was to expand the publishing industry in Korea. A metal printing press had been used as early as 1234, during the Goryeo Dynasty, but in 1403 King Sejong initiated the use of an official press. King Sejong also promoted the cultivation of paper mulberries for the development of paper quality. Further accomplishments during his reign include an astronomical observatory, a new calendar, and a system of weights and measures. A year after his death, a projectile-launching vehicle was invented, followed by the invention of rocket projectiles, and instruments to measure land elevation and distance. King Sejong died at the age of 53 and was buried at the Yeong Mausoleum (영릉; 英陵) in 1450. He was succeeded by his first son, Munjong. The street Sejongno and the Sejong Center for the Performing Arts, both located in central Seoul, are named after King Sejong, and he is depicted on the South Korean 10,000- Won note. This page was last modified on 18 April 2018, at 14:10.